Pure Intime Genital Cleaning Gel for Men is a refreshing hygiene cleanser fortified with special ingredients, emolients and plant extracts to keep you clean, refresh and comfortable all day long. Hygiene cleanser eliminates discomfort caused by perspiration, dirt and unwanted secretions. Being alcohol-free, hygiene cleanser balances the skin's natural acidic ph whilst minimizing irritation. 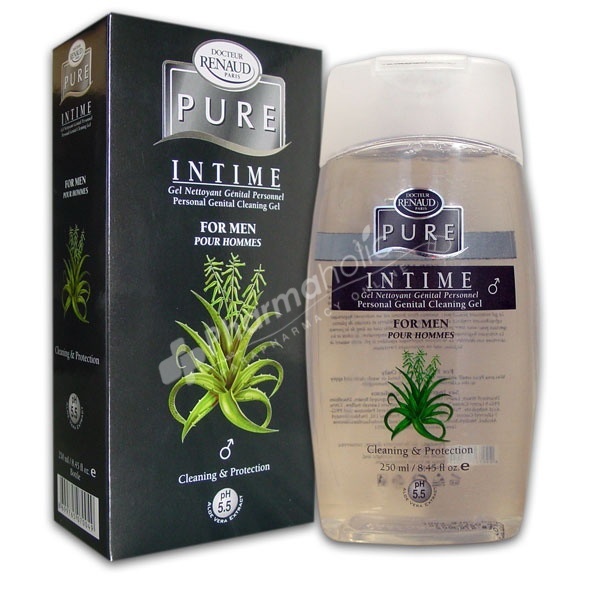 Pure Intime Genital Cleaning Gel for Men is a refreshing hygiene cleanser fortified with special ingredients, emolients and plant extracts to keep you clean, refresh and comfortable all day long. Hygiene cleanser eliminates discomfort caused by perspiration, dirt and unwanted secretions. Being alcohol-free, hygiene cleanser balances the skin''s natural acidic ph whilst minimizing irritation. - a refreshing genital cleaning gel after a stressful day. - the union of antibactrial special formula and cammomile extract calm the activity of mind and body. - help clear blemishes and acne on back area. Fortified with special ingredients, which are good anti-oxidants for treating such problems. Deionized water, Lauryl glucoside, Cocamidopropyl Betaine, Disodium Laureth Sulfosuccinate, PEG-200 Hydragenated Glyceryl Palmate and PEG-7 Glyceryl Cocoate, Citric Acid Anhyd., Fragrance, Aloe vera (aloe barbadensis gel) Extract, 2,4-Dichlorobenzyl Alcohol, Benzyl Alcohol and Methylchloroisothiazolinone and Methylisothiazolinone.